24 red rose and carnation round basket with 1/2 kg chocolate truffle cake. 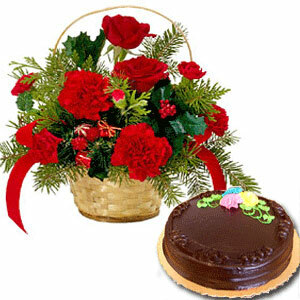 Gifting flowers and cake together on Mother’s day can uplift the mood of your mother. She just won’t stop smiling on receiving the combo pack. While the carnations and roses will fill the air with a refreshing aroma, the chocolate truffle cake will serve her appetite. The pack will help you easily convey your undying love for your mother and bring both of you together. Spend quality time with your mom this Mothers day and be a part of her happiness. Order the pack today!